My main Fender style guitar is a custom-made 62 replica with late 60s grey bobbin style pickups (see below) in Olympic White. It's fairly accurate so the neck profile at the 1st fret is as expected rather shallow with a progressive, nice taper. 7.25" radius. It follows profile number 3 below. Now I would like to have a 50s broadcaster type for playing blues, rockabilly and jazz. Whilst my Strat type guitar is my 'to go' hippy / hendrixy / 60s dream machine, I'd now like to switch to a a more workshorse, vintage Tele style that feels and sounds about a decade earlier than the Strat. It'll have a broadcaster type bridge pickup and a CC type in the neck for those 40's jazzy / T-Bone Walker moments. 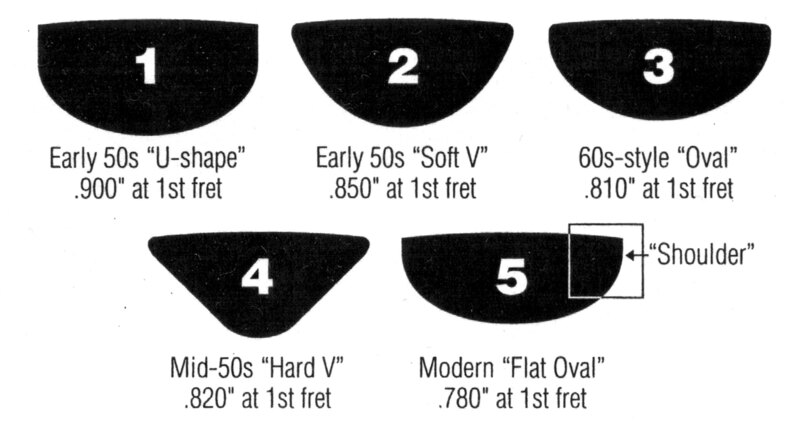 Never really had a guitar with a soft V neck before but I feel it'd be the right profile for such guitar (type 2). What do you think? The Strat profile is nice if a little bit on the slim side. I compared it to a friend's real 62 and the profile is almost identical (i.e. thin-ish). What I do NOT like are 70s type 1, Wizard type 5 or PRS Santana clubby U profiles. I guess I'm after a slightly more substantial 60s neck.... any advice? do you think it'll tick all the boxes? Thanks! I've experienced two V necks (one soft and one hard), both from PhilKing's collection. I really liked them, probably prefer the hard V even. It doesn't looks like it should be comfortable but it really is. I've sinced searched for my own guitar with a V neck and haven't found one I liked so far, since I like the big CBS head stocks, and those aren't generally V profile. As @gwEm mentioned, I have a few guitars with V necks. I have a 57 Strat which has a very hard V (John Elliott of Bravewood said it was the most pronounced V he had come across). I had him make me 2 guitars with the same basic neck shape and I love both of them. I also have a couple with the Clapton V shape, which is nice in it's own way too. If I was picking one for you, it would be a toss between the two, as I don't know how you would like the hard V. If you can try them, then obviously, that would let you know. There is a later 50's V (I think it's the 58-V), that feels really nice and is a medium V.
So I have my first V neck now too. On a 1981 Dean E'Lite (Cadillac). Its the 60s style oval at the nut and then transitions to a moderately hard V as you go up the neck.